What: The Society of General Internal Medicine to Host 2019 Annual Meeting, “Courage to Lead: Equity, Engagement, and Advocacy in Turbulent Times”, May 8-11, 2019 in Washington, DC. Members of the media are invite and welcome to attend the meeting. When: SGIM will host pre-conference activities including pre-courses, and opening poster session and an advocacy day on Wednesday, May 8. 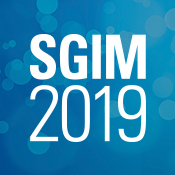 The meeting formally begins on Thursday, May 9 with an opening plenary session at 8:15 AM featuring a presidential address by Giselle Corbie-Smith, MD, MSc (2018-2019 SGIM President and Kenan Distinguished Professor, Department of Social Medicine, Department of Medicine, UNC School of Medicine). The plenary will also include lightning talks presented by Carl G. Streed Jr., MD, MPH (Assistant Professor, Department of Medicine, General Internal Medicine, Boston University School of Medicine) and Yvette Roubideaux, MD, MPH (Director, Policy Research Center, National Congress of American Indians). Members of the press who are interested in attending the meeting should contact Francine Jetton at jettonf@sgim.org to obtain press credentials.